I was born in Lynchburg, VA. My mother and father divorced when I was three years old, and both remarried when I was around six, so I essentially grew up with "two families." My mother still lives in the house that she and my father built in 1962, three years before I was born. Because it was just the two of us there for a couple of years, I took to calling my mother "Gloria," which — while it bothered other folks — suited her style just fine. We lived in what the neighbors called the "weird house." Ours was the only modern home in the subdivision — what today is referred to as a split-level home. That style was pretty much unseen back then in the age of ranches and fake Colonials. When I was young, I liked to tear things up. I spent most of my time building scale models, only to blow them up. I built skyscrapers with little plastic beams and columns, and I could make different kinds of buildings. I'd love to have it now! My biological father was a draftsman for the Virginia Highway Department — I still have some of his tools. When he left, he left some tool kits and pen sets behind, and that's what I played with as a child. Gloria picked up on my fascination for drawing and building right away. I got my own tool kit when I was five. Gloria still has the hammer! So I drew and I built things, and over the years, I just evolved into what I am today. I was a latchkey kid. I'd stay with neighbors until Gloria got home. By the time I was in 4th or 5th grade, I'd let myself into the house and entertain myself. I was pretty much a loner child. The things I liked to do weren't communal in nature. Gloria was an executive secretary, and she introduced me to the wonders of appointment calendars and Post-it notes — I became very organized. I had files for things. I had a fairly good-sized collection of paperback books, and I organized them by the Dewey Decimal system. My mother and I did everything together. She wanted to be more of a pal than a parent. We went to movies, painted the house, picked out the furniture, and did all the decorating/design work. It got to the point that we'd change things just to see if my stepfather noticed! My stepfather worked at General Electric, which is where he and Gloria met. He installed microwave communication systems and traveled to all kinds of places. I painted his car's tires one day because I thought they looked a little dull. The funny thing is, I now own that car, a 1970 Plymouth Sport Satellite. It's one of my most treasured possessions. I went to a community college, but I got frustrated with the textbook approach and lost interest. I was working as a manager at Burger King, and at that time, I thought that restaurant management would be my career path. It's an easy lifestyle when you're in your 20s, but it's not an easy profession in which to age gracefully. In the late '80s, I had come back from vacationing with friends, and Gloria said, "There is a want ad in the paper for a draftsman. I've typed your cover letter and have your resume. You need to come sign it and put it in the mail." My mother knew that working in restaurants was not what I needed to be doing. I was hired as a draftsman, and I worked at that architectural firm in Lynchburg for seven years, gaining a vast amount of experience and knowledge from the two architects who owned it. I knew then that architecture was the career field I wanted. This was back when we drew by hand, before computers were everywhere. I moved to Richmond, VA, in 1995 with a new architectural job that propelled me from draftsman to project manager within my first year. Computers had become commonplace by then, so I added that knowledge to my skill set. AutoCAD was very primitive compared to what we use today! I moved to Memphis in 1998 and worked at three architectural firms in various roles in the Memphis area: Grace and Associates for two years; JMGR for three years; and I've been with Architecture Inc. since April 2004. I became a licensed architect the same year I joined Architecture Inc. after satisfying the apprenticeship program requirements of experience over formal education. I was one of the last people in the U.S. to be allowed to do this. I am the construction administrator, so I'm in the field monitoring projects under construction. It gets me out of the office, although there are days when I go from one meeting to another to another, swapping out muddy shoes in the car. I still get to draw — when they let me! In 2006, I married Barbara Standing on Felicia Suzanne's patio on one of the hottest June evenings in recent history! We live in a small home on Mud Island with two dogs and four cats — all strays or rescues. Barbara and I are very environmentally conscious, so becoming a LEED-accredited architect in 2008 seemed like a natural fit. LEED stands for Leadership in Energy and Environmental Design. It's an internationally recognized green building certification system for buildings and communities that are designed and built using strategies that improve or reduce energy, water efficiency, CO2 emissions, and those things. Being LEED-accredited allows me to be an expert in that field on various projects. It's an additional service we can offer. 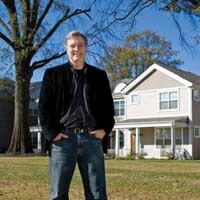 I became president of the Downtown Neighborhood Association in 2011 after assuming the role of president-elect in 2009. The organization was going in a direction that concerned many of us, so a group of us got together to try to steer it back on the course that the organization was created for. Since I have been on the board, we have increased membership, reconnected with city leaders, met with various homeless-care providers, and generally recreated a sense of a "Downtown community" among businesses, neighborhoods, service providers, and visitors. My first drawing/design job … was an elevated deck for my mother and stepfather at age 12. And it's still standing! I spent the next 20 years adding on to and remodeling their home. I suspect it needs some attention again by now. Early in my architecture years, I learned … that it wasn't about pay; it was about doing something in life that made me happy. And still is today! If you're not having fun doing what you're doing, why are you doing it? In my drawings … I'm picky. I'm not a very efficient person with time. I'm more interested in making sure it is perfect and looks artful. The biggest challenge facing the architectural industry today … is clearly, the economy. We can be in the middle of a project and the revenue sources dry up. Or the project changes focus in midstream. My worst design … Everybody has work that they look back on later and wonder, "What was I thinking?" I've got work out there that could have been better if I hadn't run into various roadblocks. It's often out of an architect's hands what the final product ends up looking like, due to the owner's change of opinion, budget constraints, and things of that nature. There are a lot of things beyond an architect's control. One of the hardest projects I worked on … Pretty much anything that involves a government agency is difficult. Lots of red tape and bureaucracy. For example, in Tennessee, they treat a picnic shelter the same way they do a prison. So you have to go through the same number of meetings, same number of submittals, same number of processes, and the same amount of paperwork, permits, and approvals for a picnic shelter as you do for a prison. The biggest misperception the public has about architects … is that we're all narcissists, that we insist on various aspects of our design because we created it and are wed to it. Actually, we insist on certain design elements because they perform an important function. My favorite part of being an architect … the variety of projects, from condominiums to private residences to … picnic shelters! Everything. Most people don't realize … that architects go through the same degree of educational training, internships, and licensing exams that lawyers and doctors go through. One of the projects I'm proudest of … is University Place, which included the first home in Tennessee to be certified as Silver in the early LEED for Homes program. The project is located off E.H. Crump Blvd., on the site where Lamar Terrace and the old Baptist Veterans Hospital used to sit. I was the construction administration architect for that project. These apartments and homes are available for Hope VI applicants, as well as the general public. I am now working on a sister project on Poplar across from the V.A. hospital. One commandment an architect should never break … Thou shalt not kill the project owner! Oh, and, Thou shalt not covet other architects' work. The part of this job that requires the most stamina … meetings. Hours and hours of meetings. We've had four-hour conference calls. The first thing I notice when I look at any building … Where's the front door? The entrance to a building should be obvious. You shouldn't have to hunt for it. I've seen buildings that have four doors — which one is the front entrance? Where do I enter? Sleep-Out Louie's … was a Cheers-type bar located beneath our second-floor offices. We called it our "big conference room." At the end of the day, we'd go down there and regroup, talk about what happened during the day. I'm still very angry that Sleep-Out closed in 2007 because the whole dynamics of this office changed. We all recognized that we don't have the same interconnectivity we once did. Heck, we got jobs and referrals from there! I met my wife Barbara … at Sleep-Out Louie's! We'd actually met one time prior, but we made our first real connection there. I'm extremely shy, so unbeknownst to either of us, two of our friends decided to intervene. Barbara's friend told her that I was interested in asking her out; my friend told me that Barbara was interested in me asking her out. It still took me a week to call her. I hooked up with Architecture Inc. by way of … Chooch Pickard. He interned here, and he knew the principals, David Scheurmann and Joey Hagan. We worked together at JMGR, and he was petitioning for a job here. I came along with him on an informal interview at Sleep-Out Louie's. In the course of the conversation, David and Joey realized that they needed my skill sets at that time more than they needed Chooch's! I was asked to come back for two more rounds of talks — over cocktails, of course. I'm not very good at … taking the time to learn things. I learn by doing and by figuring out what doesn't work based on the outcomes of my attempts. The biggest challenge with building LEED-certified structures … is getting a client to put their money where their mouth is. A lot of people have their heart in the right place, but when they realize the extra money it requires to become LEED-certified, they'd rather put the money into a granite countertop than into a more efficient air-conditioning system. People might be surprised to learn that I … co-produced, co-wrote, and performed in a local cable-access television show with three friends. It was like Monty Python meets Alfred Hitchcock meets Salvador Dali. We had a four-year run — 30 shows — in the 1990s. It took a tremendous amount of time on top of a full-time job. I suppose I didn't sleep much in those days. I would have done better in school if … we'd had the school programs that kids do today, where they go on field trips and are more hands-on with their learning as opposed to sitting at a desk and trying to learn from a textbook. In school, I'd get in trouble for … drawing! I wasn't paying attention or interacting with other students because I was more interested in sitting in the corner and drawing. I miss … drawing by hand. In fact, I have an antique drafting board in my office at home. As president of the Downtown Neighborhood Association … I want to get more people interested in DNA and Downtown. Getting the message out that we have a brand-new board and a new focus on our core mission. I want to encourage people to have a voice in their community and effect change for the positive. One of the most valuable lessons I was taught … Everyone can be replaced. Wine or beer? … Beer! I want to learn how to brew my own. My greatest extravagance … books. When I had my house in East Memphis, I had bookcases in every room, all packed full. They're organized by subject matter, of course. Items still on my Bucket List … scuba diving and jumping out of an airplane. I'd rather jump out of an airplane than speak to a crowd of people! Part of the reason I agreed to be DNA president was to challenge myself, to learn how to become more comfortable with public speaking. I have never … seen a building that could not be saved and reused. Sure, some are just simply too far gone to make them feasible, but that is much more rare than most people realize. We are surrounded by an incredible stock of sound older buildings here in Memphis — unlike any other city our size. My final 2 cents … Please remember to have your pets spayed or neutered. It's the responsible and cost-effective means to control pet over-population.